Canadian sailors aboard the HCMS Charlottetown drilled on responses to an iceberg strike. As shipping traffic in Arctic waters grows, naval and coast guard activity is growing with it. The watch crew standing on the bridge of the HMCS Charlottetown hold on tight on Sept. 2 and brace themselves against the shock of hitting an iceberg. “Brace for shock, collision imminent, port side forward,” the bridge watch officer, Lieutenant Sonia Allison bellows. But that collision never happens. 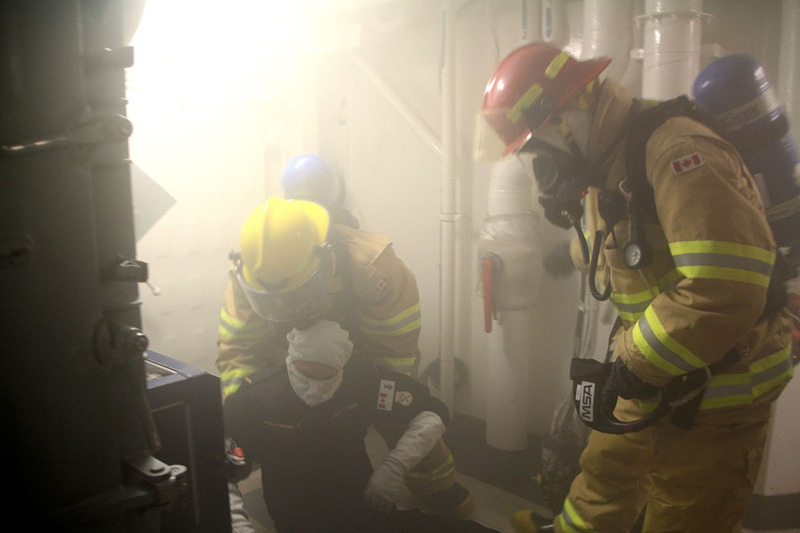 Instead, it’s all part of a mock training scenario aboard the Royal Canadian Navy frigate. The exercise occurs as the ship is sailing home to southern waters, after refuelling in Nuuk, Greenland. But, for the purpose of the exercise, the crew are pretending they’re at an earlier stage of their journey, when they sailed through Pike Resor Channel on Aug. 28, en route to Nuuk after visiting Iqaluit. The crew are also pretending they’re facing heavy fog, and had to reduce speed because of low visibility. Before the mock crash, a bridge lookout reports an iceberg just 50 yards off the port bow—at the front of the ship, on the left side. The ship hangs a fast right, but it’s too late. “That force is felt through all 134 meters” of the vessel, said Sub-Lieutenant Nathaniel Askett, who guides Nunatsiaq News through the Charlottetown to see how the ship-wide scenario plays out throughout all decks of the frigate. As soon as an alarm sounds, the ship’s commander heads for the bridge and the executive officer, who is second-in-command, to man the communications room. The impact of the iceberg ruptures the ship’s fire main, which is a series of pipes that run throughout the ship, sucking in and pressurizing seawater that can be used to supress flames. This leads to flooding around that part of the fire main and elsewhere on board. Response teams rush to isolate the flood and pump out water. To mark the flood, blue glow sticks are strewn on the ground and taped on the ruptured fire main to signify a leak. Meanwhile, a fire has started. Red glow sticks are used as a stand-in for flames. Dressed in fireman’s gear, a rapid-response team heads for the blaze. But when they find a sailor nearly unconscious amidst all the smoke, they have to rescue the casualty before putting out the fire. Were they to leave the sailor there, he could be scalded by steam. For their own safety, the fire-response teams have only 20 minutes before they have to leave the smoky space and let another response team take over. Otherwise, they would be running on reserve oxygen. In the ship’s machinery control room, where damage control is organized, engineers have all donned goggles and head coverings called flash gear. From here, crew members can isolate areas of the ship and shut down electrical systems where response teams are heading to fight a fire. A large computer system in the control room shows each deck and compartment of the ship and marks where the fire is located, where there is flooding, and what sections are closed off. Back at one of the flood sites, sailors are working to build what’s called shoring, where four-by-four beams are used to keep a compartment hatch above a set of stairs from bursting open. The scenario lasted about an hour. When it was over, officers and department heads gathered to have a post-mortem about how the practice went. Consensus was that the crew needs to keep practising, to be ready to save their ship in an isolated region where help is a long way away. 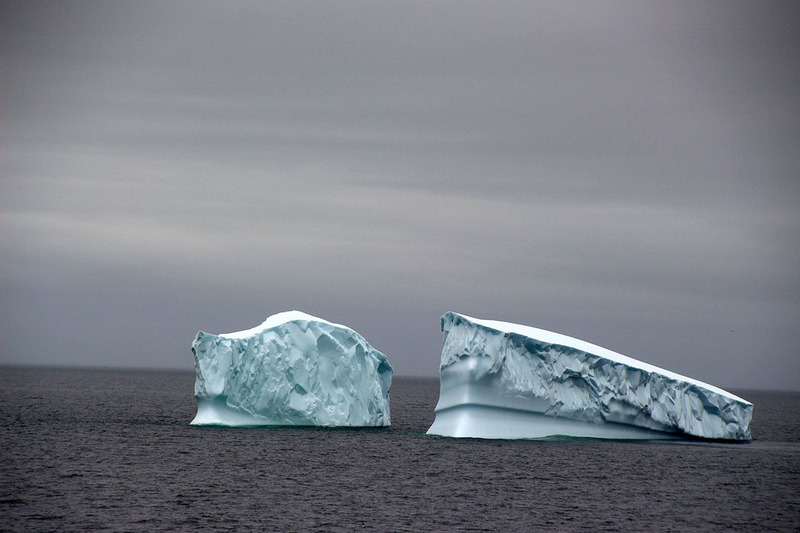 On the actual day of Aug. 28 when the Charlottetown was sailing out of Frobisher Bay, the crew did glimpse an iceberg. But it was in bright daylight, and from a distance where it could be safely admired.